Following the opening session, the historic organization's members heard industry reports from Greg Bloom, Colorado Beef Council director; Terry Fankhauser, Todd Inglee, Erin Karney and Curtis Russell of Colorado Cattlemen's Association; JoAnn McEndree of Colorado CattleWomen and Southeast Colorado Junior Cattlemen; Travis Black of Colorado Parks & Wildlife; and Josh Emick and Trec Reed of USDA. Each provided updates and fielded questions. Sen. Larry Crowder and Rep. Judy Reyher also provided brief legislative remarks while joining the ranchers at Inspiration Field. 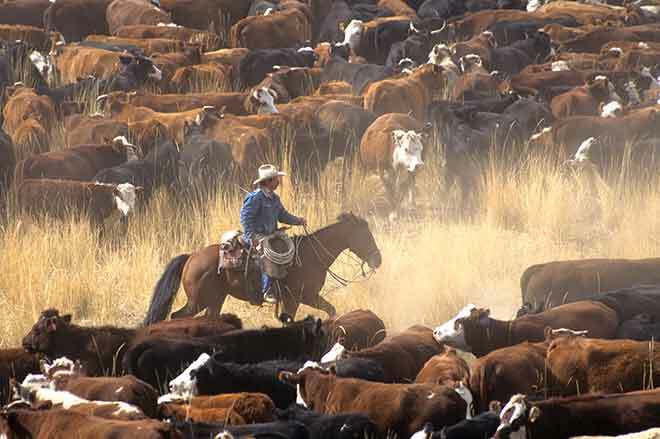 The Bent-Prowers Cattle & Horse Growers is one of Colorado's oldest livestock organizations that serves members in Baca, Bent, Crowley, Kiowa, Otero and Prowers counties. Members elected Matt Neuhold of Lamar as president; Amber Freouf of Bristol as first vice president; Bo Karney of Las Animas, second vice president; and re-elected Susan Russell of Sugar City as secretary/treasurer. Directors elected for the multi-county area are: Lori Chase, Cody Crow, Terry DeWitt, Caleb DuVall, Bruce Fickenscher, Bill Gray, Cade Hasser, Pat Karney, Reggy Lusk, Randy McEndree, David Mendenhall, Ron O'Neal, Milton Rink, Curtis Russell, Austin Schroder, Brandon Siefer, and Timy Trosper. Outgoing president Nolan Davis, plus recent past presidents Colby Mick and Pat Ptolemy, round out the board. Photo courtesy of Susan Russell. Representative Judy Reyher congratulates outgoing President Nolan Davis on successful Bent-Prowers Cattlemen festivities. 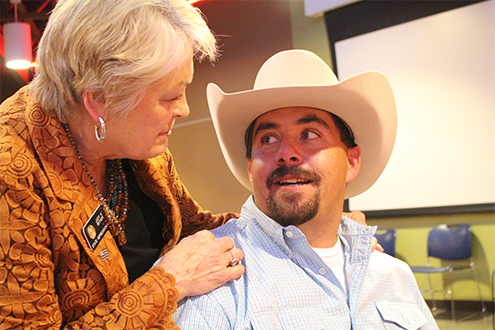 Reyher and Senator Larry Crowder both interacted with the ranchers during the April 7 annual banquet held in La Junta.